When it comes to baby gear, there are options everywhere you look in all sizes and colors. We ended up trying a few things when Big Sister E was a baby... and then a few more when Little Sister B was born. The result? A house full of things that we were constantly moving around and stepping over. Of course we didn't need it all, but how were we to know that? We didn't exactly have a group of experienced parents acting as our personal assistants to point out that such-and-such item was never going to be used, while so-and-so product would never even make it out of the box. For new parents these days, that kind of advice can easily be found at PeppyParents.com. Thanks to the fact that every product on the site has been selected by real parents, you never have to wonder about its usefulness and quality. Combine that with their large selection, wide range of prices, and helpful customer service that is available for any information you need, and you've got the perfect shopping destination! Founded in 2006 by a husband and wife team with two young, active children, PeppyParents.com has continued to be built by parents, for parents ever since. As well as offering innovative, stylish, easy to use gear for infants and toddlers, PeppyParents.com attempts to make a difference in the world by reducing their impact on the environment and making monthly contributions to respected children's charities. 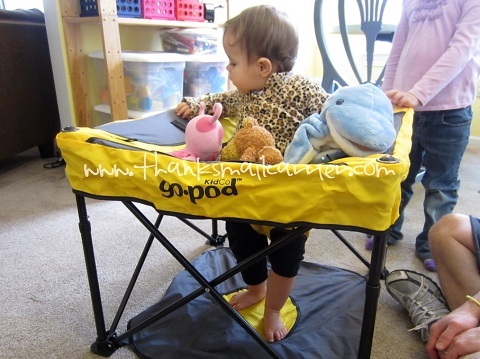 Considering I have quite a few memories of being frustrated by the amount of unnecessary baby gear we had around our house while my girls were young, I wasn't surprised that PeppyParents.com would sell something as convenient and innovative as the Kidco Go-Pod portable activity baby seat. 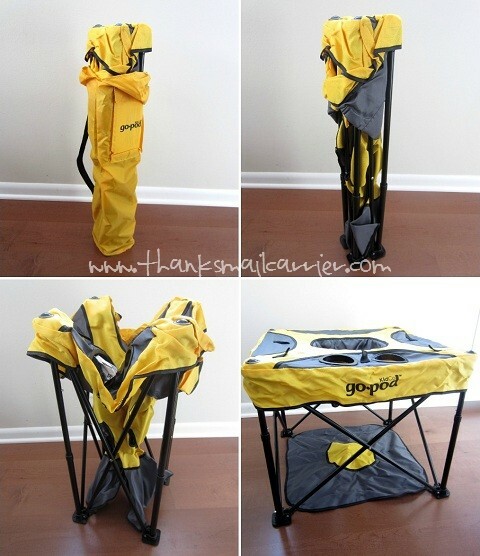 An ultra lightweight, portable activity seat developed as an alternative to bulky, stationary activity centers, the Go-Pod has a one-of-a-kind 'mobility design' that is perfect for all of your in-home or travel needs. Whether you have a smaller living space, are constantly on-the-go or simply don't want to feel as though bulky items are taking over, the Go-Pod can provide a safe, comfortable, entertaining location for your little one with ease. As soon as I had the Go-Pod out of the box, the portability and small amount of space that it takes up when folded was evident (6.5" W x 6.5" L x 29.5" H). There definitely wouldn't be any problem sliding this slim bag into a closet, under a bed or into a car trunk! In terms of setup, the Kidco Go-Pod truly took all of around 20 seconds to have it completely ready for use — and what busy parent doesn't love that? 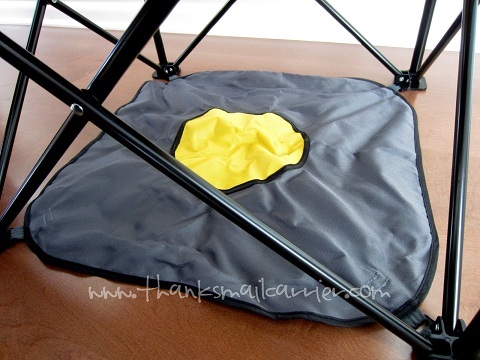 Simply carry this 7 pound item by the handy carry strap to your destination and unfold it the same as a nylon chair at a sporting game. 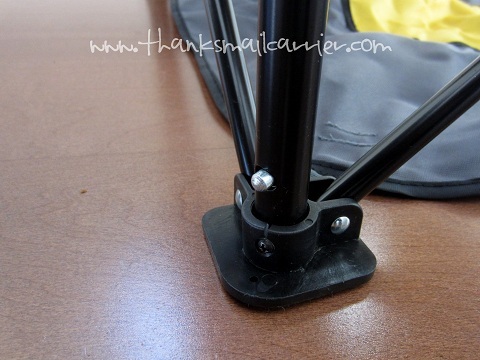 In four quick steps, this gear goes from bag to stationary activity center! This really couldn't be much easier! By simply removing the carry bag, the Go-Pod opens fully to become the perfect place for a little one (approximately 4 months - walking age) to stay contained, safe and able to have fun anywhere and anytime. ...and the attached floor pad flattens right out so that baby's feet don't touch the ground. No worries about what might be on that gymnasium floor, campground dirt or your cousin's suspicious carpet! 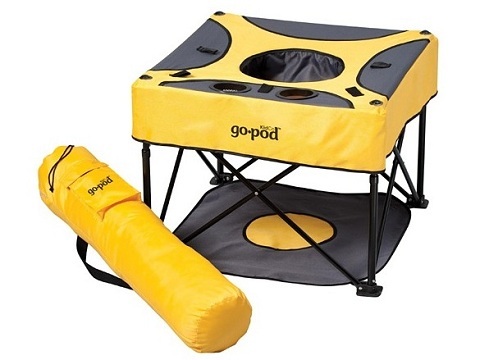 When it comes to keeping your little one entertained, the Go-Pod includes a snack and drink holder, as well as five nylon loops for attaching any favorite small toys. Just add Cheerios, a sippy cup or colorful toys to grab and pull and your baby will be happy while you wash dishes, eat lunch, grab a shower and much more. 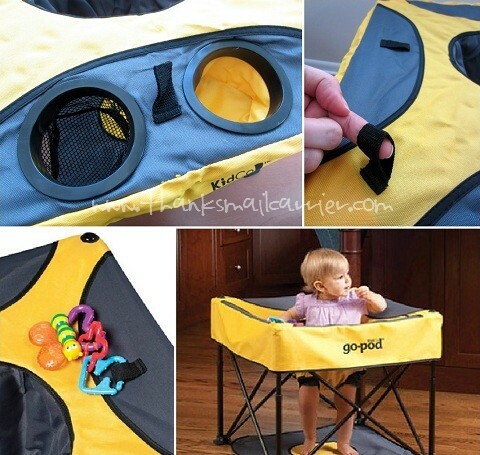 Compact, portable and great for indoors or out, the Kidco Go-Pod requires no assembly, takes only seconds to set up, and is designed for babies weighing 12 to 26 pounds. I love that Kidco made it so easy to use the button adjustments on each of the legs to move it between the four height options, so that it is quick and simple to raise the seat higher as your baby gets taller. The end result is a 24" square activity center that easily makes parents as well as children happy! Retailing for $49.95 (with free shipping!) from PeppyParents.com, it is easy to see that the Kidco Go-Pod is a parent-tested, -approved, and -recommended product that will be used time and time again. To find out more about this and all of PeppyParents.com's unique and high quality products, visit them at PeppyParents.com and connect with them on Facebook. 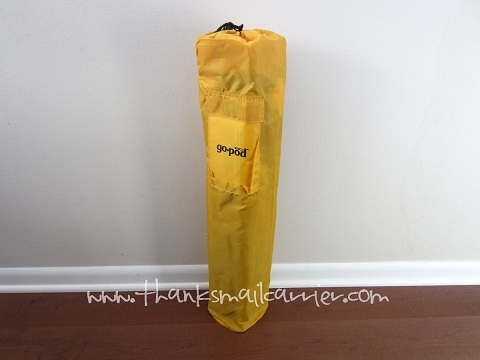 Other than the Kidco Go-Pod that I was provided by PeppyParents.com to facilitate my review, I was not compensated or enticed to do this review in any way. This post is solely my honest opinion of this site and this product. I wish I would have had this when my son was young enough to use this what a great idea. Like this a lot and looks like it would keep the little one content. 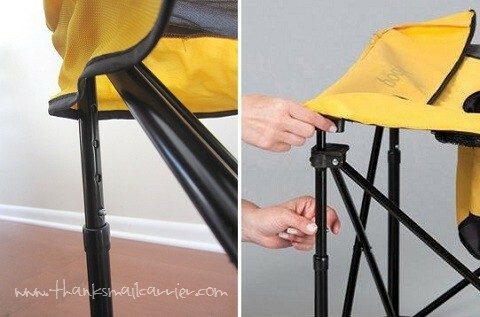 Love the portability! Wow, the Kidco Go-Pod looks like a great seat to occupy and keep baby in a position to enjoy upright movement and activity! I appreciate how easy to assemble and portable it is! It also looks safe and comfortable for baby. I'll have to keep Poppyparents in mind. Thanks for sharing.